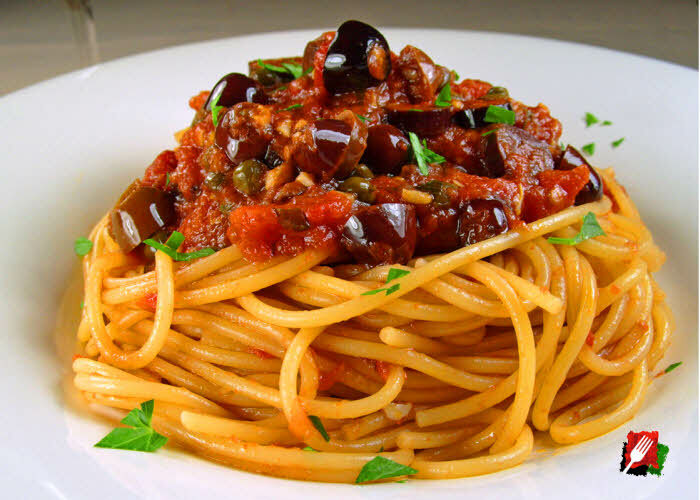 Spaghetti puttanesca is a bold Italian dish that features a tangy sauce that explodes with flavor from voluminous amounts of garlic, capers, olives, anchovies, crushed red pepper flakes, tomatoes, and topped with parsley. 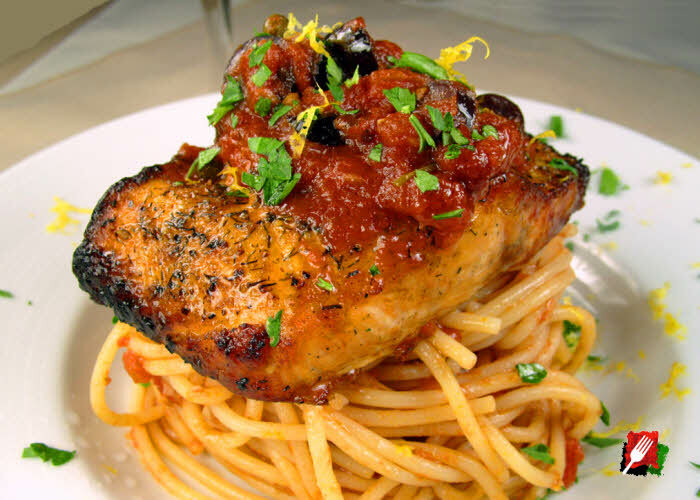 This sauce is delicious on everything from pasta to pizza, delivering bold, authentic Italian flavors that are a rich indulgence you won’t soon forget! 1. Use your hands to crush and break down the whole tomatoes in a large bowl. Remove any tough skins, discolored, or green tomato stems and basil leaves from the can, then crush the tomatoes loosely for a full-bodied sauce, or for a smoother sauce, use a food mill or potato masher rather than a blender to maintain the rich color. Reserve the bowl of tomatoes with their liquid for later use. 2. Heat the olive oil in a skillet over medium heat. When the oil is hot, stir in the anchovy filets. 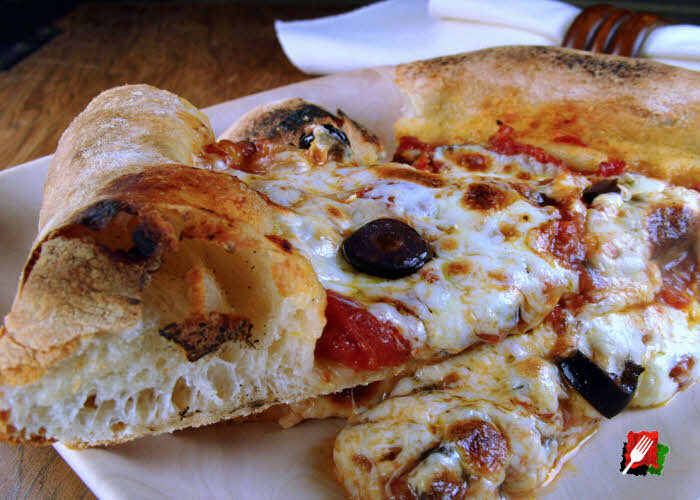 With the back of your spoon, break the anchovies up until almost dissolved but not burned, about 2 minutes. Then add the garlic and red pepper flakes for a minute or two, stirring continuously to prevent the garlic from burning. Now would be a good time to get the pasta water started for the spaghetti. 4. With the sauce reduced, stir in the sliced olives and drained capers to the pan. Cook down over medium low heat until done, another 10 minutes. Optionally add 2 teaspoons of lemon zest. During this time, add dry spaghetti to boiling pasta water, cooking the spaghetti al dente per the instructions on the package. 5. With the pasta al dente, add the wet pasta directly to the pan with a pasta fork. Drizzle the remaining tablespoon of olive oil over the pasta and mix all of the ingredients thoroughly for another 2 minutes. To serve, plate with a generous amount of coated pasta, top with a little extra sauce from the pan, then garnish the plates with the remaining fresh parsley. Serve immediately while hot. Refrigerate or freeze any unused marinara for later use. 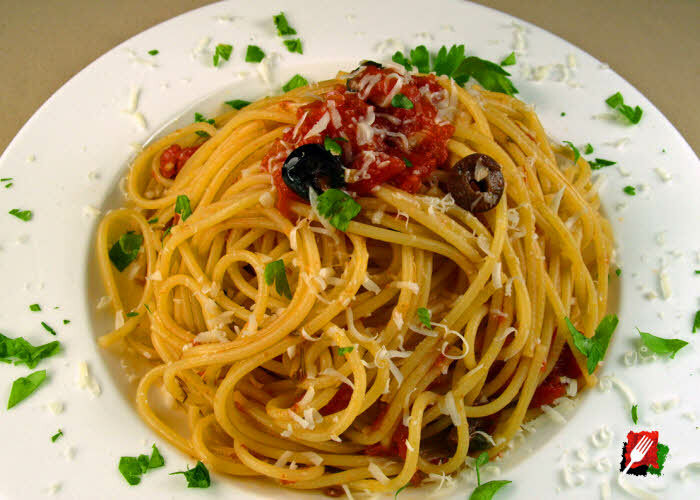 For a simple spaghetti puttanesca meal for one, cook about 4 ounces (1/4 box) of dry long pasta in salted water. In a separate pan warm up 4 ounces (1/2 cup) of puttanesca over medium heat. When the pasta is cooked al dente, use a large slotted spoon or pasta fork to move the wet pasta directly into the sauce pan. Stir for a minute or two to thoroughly coat the pasta. Plate up this generous portion of pasta and top with a little extra sauce, freshly grated Parmigiano Reggiano, and garnish with freshly chopped basil. Serve immediately while hot. If you make a lot of pasta and pizzas with this sauce, make a double batch. It stays fresh in the refrigerator for more than two weeks, and you’ll always have delicious puttanesca ready for a quick meal. To double up on this recipe, extend the cooking time from 10 to 20 minutes.